My ongoing series of smart phone enabled posts. Nobody knows how to make the most of a beautiful fall day like farm kids. 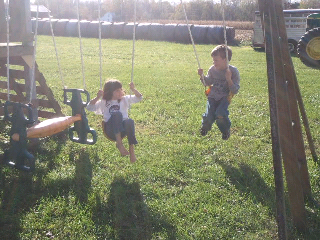 Here Justin and Morgan enjoy the swings after Justin got back from a trip to the grain elevator with GrandDad.